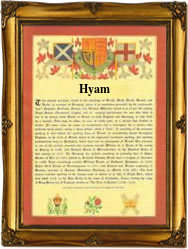 Recorded as Higham, Hayem, Heyem, Hyam, Hyams, Hyman, and others, this is a surname of two possible origins. It can be one of the oldest English surnames, and if so is locational, or if Ashkenasic it originates from the Hebrew word "khayim" meaning life. The English origin is from any or all of the various places called Higham, in the counties of Bedfordshire, Derbyshire, Essex, Kent, Lancashire, Leicestershire, Northamptonshire, Suffolk, and Yorkshire. Most are recorded in the famous Domesday Book of 1086 as variously Echam, Hecham, and Heiham, and all share the same meaning of the high homestead. Higham in Sussex, recorded as Iham in the year 1200 bucks the trend, by translating as an island in a water- meadow! If the surname is Askenasic or Jewish it was introduced into England after 1655, when Oliver Cromwell lifted the restriction against immigrants, allowing Jewish people in particular, to settle in the country. Many adopted English surnames which had an association if only in (near) spelling with Hebrew words or names. Early examples of the surname recordings include Robertus de Hegham in the Poll Tax rolls of Yorkshire in 13279, and John Higham in the Wills record of Cheshirein 1445. The christening of John Higham, was recorded at Garstang, Lancashire, on March 1st 1587. An early coat of arms associated with the surname has the blazon of a blue field, charged with a bend cotised in silver. The first recorded spelling of the family name is shown to be that of Osward de Hecham. This was dated 1176, in the Essex Pipe Rolls, during the reign of Henry 11nd, known as "The Builder of Churches", 1154 - 1189. Surnames became necessary when governments introduced personal taxation. In England this was sometimes known as Poll Tax. Throughout the centuries, surnames in every country have continued to "develop" often leading to astonishing variants of the original spelling.